The unparalleled master of the high-octane, high-body-count, mile-a-minute, explosion-filled, summer-action-blockbuster-on-paper returns with — well, another high-octane, high-body-count, mile-a-minute, explosion-filled, summer-action-blockbuster-on-paper. But as the saying goes, if it ain’t broke, don’t fix it, so Matthew Reilly is well entitled to replicate his usual winning formula. While the story requires even further suspension of disbelief, and the bad guys are a little too moustache-twirling, The Three Secret Cities delivers where it ultimately counts: the action. The fifth Jack West Jr. thrill machine goes on at a jet-fuelled pace that doesn’t let up; it’s pedal to the metal stuff from page one, and picks up where The Four Legendary Kingdoms ended. Reilly filters enough information through to bring new readers up to speed, but it’s probably worthwhile reading West’s fourth adventure before jumping on board for this one. There are a lot of characters and continuity to be mindful of in the ‘Reilly-verse’ now that his Shane ‘Scarecrow’ Schofield series has blended into West’s world. You don’t need to know it all to enjoy The Three Secret Cities, but by design, Reilly’s books don’t pause for much recapping or thoughtful character moments; fans have fallen in love with these characters over multiple books. They began life as fairly standard hero archetypes, with thinly-sketched personalities, but as the series has continued Reilly has provided more background and colour to his cast. Readers starting with The Three Secret Cities might struggle to find much to latch onto; but assuming you’re just here for the chases, and the gun battles, and the impossible escapes, you’re going to be just fine. The plot boils down to another end of the world scenario; only this time, Jack West Jr. is responsible for its instigation following events of the previous book. Now on a desperate hunt for the Three Secret Cities to locate three ancient weapons that hold the key to ending the threat, West and his crew are the target of several enemy forces, who will stop at nothing to see them obliterated from the face of the earth. Standout set-pieces this time around include an explosive encounter at a New York skyscraper involving a hover-capable V-22 Osprey attack plane (armed with the obligatory missile pods and cannons) and an outrageous scene in London that involves a tank. Longtime readers will rejoice when a fan-favourite character makes an appearance, and some might even shed a tear for the book’s final twist; although unfathomably Reilly undercuts much of this emotional gut-punch with an epilogue that probably wasn’t necessary. At times, The Three Secret Cities feels a bit overcrowded, but for the most part, most of the series’ major characters gets his or her moment in the sun. The book has everything Reilly’s fans have come to expect: sensational combat sequences packed with thunderous explosions, vicious hand-to-hand combat, suspense-filled feats, and more than one unhinged, evil villain. Once again, Matthew Reilly has raised the bar for the action blockbuster novel. I wouldn’t be such a prolific reader, and certainly wouldn’t be bookseller, if not for Matthew Reilly. Specifically, his book Ice Station, which I read at such an integral stage of my life, around the age of 13, when I was drifting away from prose, and focused almost exclusively on comics. You hear stories like this all the time from his legion of fans; how Reilly’s action-packed books proved to be a revelation for readers, demonstrating that it’s possible to transpose the incredible thrills of summer movie blockbusters to the page. Turns out books can provide the same kind of entertainment. Who knew, right? After Ice Station, Contest, and Temple, during the wait for Area 7, I read books by Robert Ludlum, Jack Higgins, Dan Brown; the usual band of high-action thriller writers. And eventually, much (much) later, I expanded my “literary horizons” (ugh sorry, that phrase makes me queasy, but it’s for want of something better); started reading crime, then moved onto other genres, eventually dipping into literary fiction. Seems funny to say it, but there’s no way I would’ve read Hanya Yanagihara’s A Little Life –- probably my favourite book (as in, like, ever) — without Matthew Reilly. I owe him a lot. The Four Legendary Kingdoms begins with Jack West Jr. waking up in an unknown location and immediately thrust into battle. We quickly learn he has been chosen, along with a dozen other elite soldiers (including a very familiar face, much to my surprise and delight), to compete in a series of spectacularly deadly challenges in order to fulfil an ancient ritual with world ending consequences. So, yeah; the stakes, as always, are astronomically high. This isn’t a game West can escape from. For the sake of his loved ones — for the sake of everyone — he’s got to compete. Reilly delivers fantastic stunts and vehicular mayhem in incredibly creative combat arenas. The plot and characters are ludicrous, but its all stupendous fun, and it moves at the velocity of a speeding bullet. Faster, actually. Reilly rarely lets his readers — or indeed his characters — rest. There are brief interludes between all the thrills, when the unflappably indestructible West gets the chance to lick his wounds, and Reilly gets the chance to feed readers background information. Sure, it can be a little clunky at times — only Reilly could get away with the sentence, “Vacheron grinned evilly,” and the book is entirely void of subtext — but The Four Legendary Kingdoms is a rollicking blockbuster ride and perfect weekend fodder. When it comes right down to it, other authors can try (and have tried) to emulate him, but nobody is better at the high-octane-high-body-count thriller than Matthew Reilly. It’s his domain, exclusively. Fans will delight in Jack West Jr.’s return, and of course, plenty of thread is left dangling for the inevitable sequels. Bring ’em on, I say! Perfect beach reading. After last year’s comparably sedate novel, THE TOURNAMENT, Matthew Reilly returns in 2014 with the action-packed blockbuster THE GREAT ZOO OF CHINA. Think Crichton’s “Jurassic Park” with the raw speed of Reilly’s “Contest” – then up the stakes to a colossal degree. You’ve never read an action novel like this. Cassandra Jane ‘CJ’ Cameron is our hero. Alongside her brother Hamish, and a cast of ultimately forgettable human allies, she is granted the opportunity to tour China’s newly developed, but intriguingly clandestine zoo. The secrecy was necessary, however, because this isn’t a normal zoo: the animals caged in this enormous man-made arena are in fact dragons, of varying sizes; some as large as airline carriers. Naturally, there are various safeguards in place to prohibit the dragons from escaping the perimeter; various strategies in place should the worst-case scenario occur. And, naturally, all of these failsafe’s fail. When they do, the Great Dragon Zoo of China becomes a battleground for CJ and her friends, as they face titanic-sized aggressors. Soon it’s not just about their survival, though; the dragons are far more intelligent than their human captors have credited them. Suddenly the safeguarding of mankind is in CJ’s hands. Reilly’s latest offering lacks any subtlety. It’s loud and cacophonous – a multitude of exclamation marks pepper these pages – and it’s unapologetic for it. There are the obligatory car-chase sequences and shoot-outs, and death-defying last-minute escapes. Comparisons to Crichton’s “Jurassic Park” are inevitable; they are almost identically framed, with the size of the aggressors being the only real alteration of note; but whereas Crichton’s novel always felt grounded in reality, in theoretical science, THE GREAT ZOO OF CHINA is the stuff of sheer fantasy. “Jurassic Park” was genuinely frightening as the dinosaurs stalked their prey; the dragons here are so immense, so impossibly-sized, they become cartoon-like antagonists rather than fearful foes. THE GREAT ZOO OF CHINA is a morass of over-the-top carnage, slight character development, and continuously escalating stakes. It’s a blockbuster only Matthew Reilly could write. I can’t quite work out what TROLL MOUNTAIN: THE COMPLETE NOVEL is. It possesses elements of a children’s fable: an unlikely hero facing up against impossible odds, triumphing over the injustices of his society. Indeed, in the interview at the back of the novel, TROLL MOUNTAIN is referred to as ‘family friendly,’ and it could be precisely that, were it not for the overly (and avoidably) violent moments peppered throughout the text. At moments, TROLL MOUNTAIN struggles for equilibrium between Reilly trying to cater to his legion of fans of his mature series (Scarecrow, The Tournament, Temple, etc) and recapturing the exuberance of HOVER CAR RACER, a true family-friendly novel. TROLL MOUNTAIN is a rip-roaring, simple adventure, and it is intended as such. When his sister falls ill, Raf journey’s up Troll Mountain seeking an elixir, meeting allies along the way, who both aid his expedition, and teach him valuable life lessons, particularly about brute force, and how it should always be a last resort. It’s a strong theme, but it’s far too pointed: there’s very little nuance to the prose, which again, wouldn’t be a negative factor if the novel was aimed squarely at a younger market, but its violence negates that entirely. This is pure, unabashed Matthew Reilly in all his glory: a rollercoaster, full of action-packed set-pieces and extravagant scenarios. Young and adult will enjoy TROLL MOUNTAIN: but parents should use their discretion, and make sure their child is able to handle reading about impaled corpses, and blood spraying in every direction. These scenes are stark, and Reilly avoids elongated descriptions of these events, but even so, tread carefully. 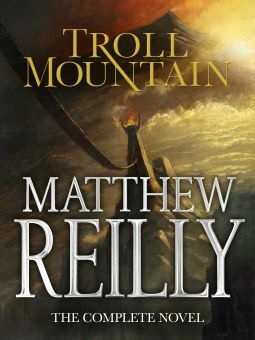 For the rest of us, and I include myself as a Reilly fanboy, TROLL MOUNTAIN is a nice sojourn as we wait for his next full-length release later in 2014. 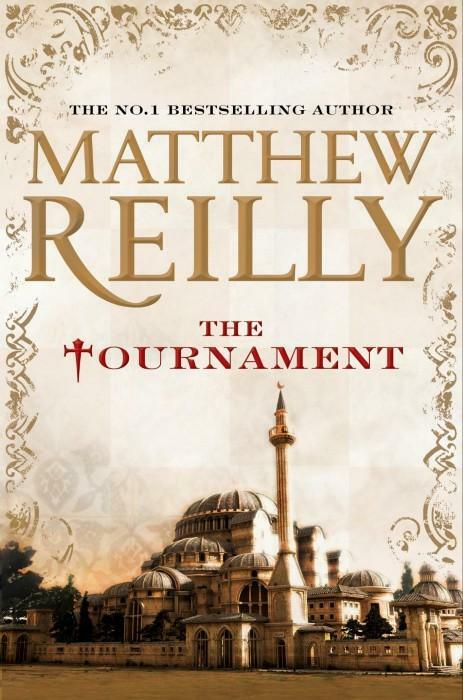 The Tournament has been dubbed as a medieval mystery with “a Matthew Reilly engine.” That’s a nice marketing term, and it’s sure to make the novel appeal to Reilly’s steadfast readership, but I think it does the novel – and Reilly – a disservice. The Tournament is an entirely different beast, and not just because of the ancient setting or the fact it’s steeped in history (which is appropriately blemished for entertainment’s sake). Calling it Reilly’s first ‘adult’ novel undermines his catalogue of action-packed, adrenaline-fueled thrillers (all of which I enjoyed greatly) – but whereas those were epic blockbusters, The Tournament is a tightly-focused exploration of its cast of characters through the eyes of a thirteen year old Queen Elizabeth I. The narrative is anchored by a murder-mystery during the first ever Chess tournament between world superpowers, but it’s fairly formulaic stuff. It’s engrossing, don’t get me wrong, punctuated with plenty of surprises and a few hallmark action sequences – but it’s the deeper tale involving the eventual-Queen’s exploration of mankind and its capacity for good and evil as she and her teacher, Mr. Ascham, seek to solve the case that is truly enthralling. Ultimately, not being a fan of period pieces or ‘alternate history’ narratives hindered my enjoyment. If you’re a fan of either of those, you might be safe adding another half-star to my rating. Beyond that wholly subjective critique, it was fantastic seeing Reilly dial down the action and offer us something we’ve not seen from him before. Whatever type of author you defined Reilly as before The Tournament, you need to read this and reassess.